Clear Polythene Bags There are 5 products. High quality, low density, and 100% food safe, our polythene bags are completely suitable for catering and food storage use. But food isn’t the only thing you can fill our polythene bags with! They are a really versatile and indispensible resource for homes, workplaces, shops, schools and practically anywhere that waterproof, small scale, transparent handy storage is required. 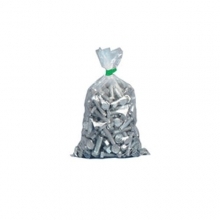 We supply light, medium and heavy duty thicknesses of polythene bag. Our heaviest duty bags are a full 500 Gauge, which means you can trust them for use with heavier contents in the workshop and expect great quality protection and robust performance. If you order our lightest duty polythene bags at 120 Gauge, they’re perfect for sandwiches and the contents of your fridge or freezer, among other uses. 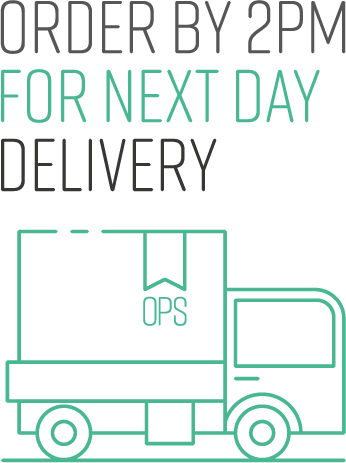 Many of our bags are supplied in cardboard box dispensers for optimum convenience, and our prices are highly economical, especially if you’re looking to buy in bulk. Clear polythene makes it easy to identify the contents at a glance, and because our polythene bags are food-friendly, they are perfect for the kitchen and the shop counter, without any worries about health and safety. When you’re looking to seal them, a quick knot in the neck could be just the thing. But we also supply purpose-built bag sealers for the job – heat sealers, bag ties, bag neck sealers – all fit for professional use. They’ll keep your contents watertight, waterproof, safe from contamination, and clean and fresh for later use. 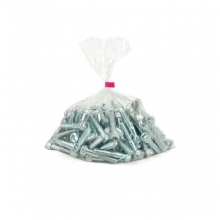 Our polythene bags – just another reason we’re bursting with enthusiasm over packaging supplies! Our 120 gauge clear food safe light duty polythene bags come in varying sizes from 3" (75mm) to 24" (600mm). 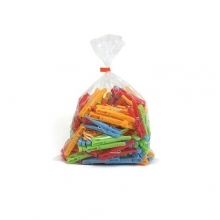 120g poly bag sizes are supplied in polythene dispenser pack or cardboard dispenser boxes depending on available stock. Approved for food use. Manufactured from low density 100% virgin quality polythene. Read the full product description. 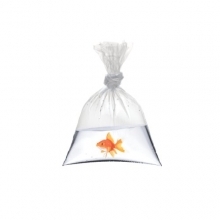 Our 200 gauge clear food safe medium duty polythene bags come in varying sizes from 7” (175mm) to 10” (250mm). The more common 200g sizes are supplied in a handy cardboard dispenser box. Approved for food use. 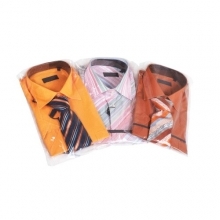 Manufactured from low density 100% virgin quality polythene. Read the full product description. Our 150 gauge clear food safe light duty polythene bags come in varying sizes from 6" (150mm) to 24" (600mm). The more common 150g sizes are supplied in a handy cardboard dispenser box. Approved for food use: Manufactured from low density 100% virgin quality polythene. Read the full product description. 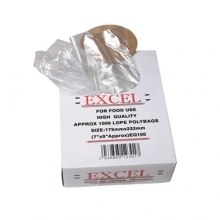 Our 250 gauge clear food safe medium duty polythene bags come in varying sizes from 6" (150mm) to 18" (450mm). The more common 250g sizes are supplied in a handy cardboard dispenser box. Approved for food use: Manufactured from low density 100% virgin quality polythene. Read the full product description.